AFTER a truly horrible 2015 in the equity market, there is some satisfaction that the Financial Mail can report a 40%-plus gain in our “small cap” portfolio. Our two “dogs” — Cadiz and Digicore — were subject to buyouts before the close of the calendar year. Perhaps this is fortunate: cashing in a premium price (or Stellar scrip in Cadiz’s case) instead of enduring a prolonged turnaround. Logistics specialist Value Group was the drag on the portfolio gains, though more than offset by the surges in revitalised Conduit Capital and the overlooked technology group, Silverbridge. 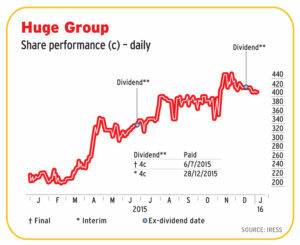 Looking ahead to 2016, the Financial Mail offers a new format in that we have picked a dozen shares. The change stems from sniping criticism (you know who you are!) that a five-share selection is not a portfolio, but also from the fact that the JSE currently offers an abundance of “interestingly” priced small cap opportunities. The selection criteria are consequently altered to accommodate the larger selection — and this year we will limit the universe of stocks to companies with a market capitalisation of less than R2bn. Bowler Metcalf. This plastics packaging specialist initially spooked the market when it walked away from a major client when the pricing levels were no longer viable. It has since found an abundance of new business at acceptable margins, and appears to be making its investment in technology pay off handsomely. The share is fundamentally cheap, and there could be a medium-term bonus when it lists its soft-drink investment, SoftBev. Sabvest. This small investment company is the JSE’s secret rand hedge with a controlling stake in cash spinning industrial textile maker SA Bias Industries — which has production plants scattered around the world. Sabvest also holds a portfolio of global blue chip stocks as well as strategic positions in various local and offshore enterprises. Amalgamated Electronics Corp. As a maker and distributor of security technology, Amecor occupies a niche where trade tends to be brisk no matter the economic situation. 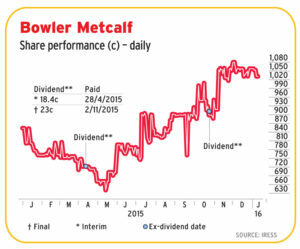 The company is well managed with strong cash flows and a fairly generous dividend policy. Huge Group. This is a gut-feel call. Operationally things have started to ring for this small telecoms specialist, but we suspect there might be a good chance of value unlocking via corporate action. Indequity. This small insurance specialist has delivered profit growth year after year. Management might be a tad too conservative, but then again there’s no reason to take strategic risks if the product pitch is churning reassuring premium growth. Metrofile. Solid, dependable, cash-flow generative and unlikely to undergo any significant slackening in its document storage niche. Distribution & Warehousing Network. Management at this building supplies conglomerate are working hard at restoring some respectability to margins. 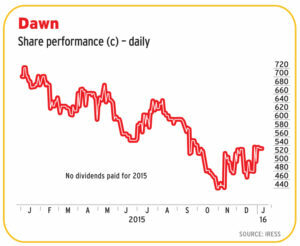 If they keep succeeding — and business levels don’t fall off a cliff — the Dawn share price should finish this year markedly higher. Sovereign Foods. Ignoring some ill-founded performance bonus payments, this Uitenhage poultry group is a superb operation. But Sovereign persists in trading at a discount to tangible net asset value — which might well lead to a raid on the henhouse. This, we reckon, will mean management will have to be on their toes and work hard to extract efficiencies to boost investor sentiment. Not much downside. Trematon Capital Partners. The investment in Club Mykonos Langebaan is starting to pay off and the company has an ace up its sleeve with an influential stake in the Mykonos casino (especially if the cards fall into place for a second casino licence in Cape Town). But investor focus this year will be on a new private school venture — which could be a game changer. African Media Entertainment. There is still a clear profit signal from this largely overlooked niche broadcasting group. Prescient. This asset manager has not caught the market’s fancy in spite of the rush to back newer listings in the sector. But Prescient’s low equity model might be an advantage in jittery market conditions in the year ahead. Did we mention that CEO Herman Steyn does not draw a salary, but opted for remuneration in the form of a scrip holding? Cullinan Holdings. Activity for this tourism and travel conglomerate was hindered in the past financial year by visa regulations, xenophobia and Ebola. The year ahead, especially with the weaker rand, should bring brisker levels. Cullinan’s fledgling financial services division shows promise too.